Amazon Echo Link Amp review | What Hi-Fi? Amazon also now has two ‘hi-fi’ components of its own: the Echo Link, which you can add to an existing amplifier, and the Echo Link Amp, which is designed to power any standard pair of passive speakers. On paper, the Echo Link Amp makes a compelling case for itself – it’s less than half the price of Sonos’s new Amp, and over £100 cheaper than Sonos’s outgoing Connect:Amp. But there’s just one problem, the Amazon Echo Link Amp sounds really poor. The Echo Link Amp is strikingly unstriking – there isn’t even a logo to identify it as an Amazon product. The matte black finish is only broken up by a black volume knob, ringed by 10 white LEDs that indicate the volume. There’s also a 3.5mm headphone socket on the bottom-right of the fascia, but otherwise the Echo Link Amp is almost entirely unadorned. The top panel is covered with holes, designed to allow air to escape, and the rear houses a whole host of connections. It’s an odd move for Amazon to launch such a nondescript product. Though it could suggest confidence in the sound quality, you’d expect Amazon to make its customers feel at least a little bit special. Unfortunately, we don’t imagine any Echo Link Amp buyers will – this device certainly won’t inspire the same inquisitive interest and admiration as its Echo devices do. The Link Amp approaches music streaming in the same way as Amazon’s Echo speakers. Initial set-up is straightforward and handled by the Alexa app, but for actual streaming the app is rather limited and unintuitive. There’s no way to search for music across multiple services, for example, and no way to add tracks to an on-the-fly queue. If you only use Spotify, that’s no problem, you can just use the Spotify app and select the Echo Link Amp as the destination for your music. Amazon Music users will find that app more useful, too, although it also lacks the ability to create on-the-fly music queues when the Link Amp is the destination. Subscribers to other services are largely out of luck. The Echo Link Amp supports Apple Music, but it can’t be selected as a playback device due to a lack of AirPlay support. It is only accessible via the Alexa app, while the more hi-fi pleasing services such as Tidal and Qobuz are entirely unsupported. Internet radio is available, via TuneIn, and Deezer is on board for those who use it. Disappointingly, there’s no support for UPNP, which makes accessing your own digital tunes less straightforward than it should be. You can go down the Plex media player route, but that’s not supported by all network storage devices and can be fiddly on those that it is – although you can at least benefit from Alexa-based voice control. That said, Amazon’s claims that with the Echo Link and Link Amp it’s “actively engaging with customers who are into hi-fi” are slightly undone by a lack of support for hi-fi quality streaming services and UPNP. On the subject of voice control, the Link Amp doesn’t have any built-in microphones, so isn’t an Alexa device in its own right. It can easily be incorporated in an Alexa set-up, by installing it along with an Echo Dot and set the two units as one ‘group’, with the Link Amp as the output device. Issue a simple instruction such as “Alexa, play David Bowie”, and Bowie’s music will automatically begin playing from the stereo speakers connected to the Link Amp. You can also set the Link Amp up on its own in a house that already has Alexa devices in it. Here, just issue the command to the Alexa smart speaker and specify the Link Amp, renamed based on where it is in the house, as the destination player. For example, “Alexa, play David Bowie in the lounge”. The first of those routes is clearly the neatest, and the one that Amazon is encouraging via a reduced-price bundle with the Link Amp and an Echo Dot. It’s a shame that the Link Amp doesn’t have a USB socket that could be used to power an Echo Dot. A lack of USB sockets aside, the Link Amp has a good selection of connections, with coaxial, optical and RCA analogue inputs and outputs, plus a headphone-out and a pair of speaker terminals for connecting passive speakers. We try a number of speakers during testing, from our reference ATC SCM50s to more price appropriate ones such as the excellent Elac Debut B5.2s. The Link Amp supports Bluetooth, too, although Amazon won’t reveal the format, confirming only that it’s A2DP compliant. There is no way to manually switch inputs, either on the device itself or in the app. 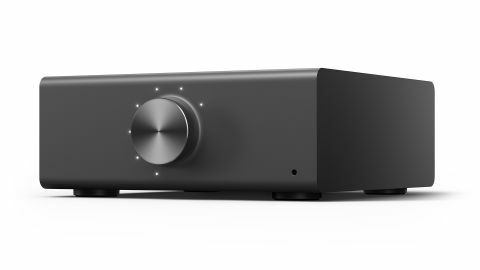 Instead, the Link Amp employs automatic switching, based on a strict hierarchy that runs from streaming to Bluetooth, then optical, coaxial and, finally, RCA. While having control taken away from the user might be irritating, it proves largely unproblematic during testing. We imagine the sort of person who buys a Link Amp will find automatic switching to be right up their street. But while there are slight issues around the Link Amp’s usability, the real problems begin when you start to listen to it. From the off, it is a dull and cluttered delivery with little in the way of dynamics, even at the bigger, more obvious end and certainly not in the subtler, more nuanced parts of a track. We play The Funeral by Band Of Horses and, while the quiet opening isn’t too bad (there’s not a lot to get wrong), the Link Amp struggles to deliver the ethereal quality of the vocal. There’s a lack of width and spaciousness to the soundstage – the track doesn’t kick in when it should and the first note of the chorus, which should have real impact, is soft. The combination of poor timing, a lack of weight and almost non-existent dynamics robs the music of drama and excitement. We switch to Ether by Mogwai, an emotive track built around a slow build of scale and volume. Played through the Echo Link Amp, it’s dynamically flat. As more instruments are added to the ensemble, the presentation becomes more cluttered and less coherent. Drawing out individual strands is fruitless, as is drawing out any excitement. Listened to via any piece of even half-capable piece of hi-fi equipment, this track is full-bodied, open and atmospheric. There are nuanced, low-level dynamics to each note as well as a dynamic progression to the track as a whole. To say the Link Amp is below that standard is an understatement. Switch to No Captain by Lane 8 and the lack of body in vocals is noticeable. The degree to which they sound thin and lifeless is striking – it’s like listening to someone whisper loudly rather than use their full voice. When listening to music via the Echo Link Amp, there’s a nagging feeling that you’re missing out on something, whether that’s rhythmic punch, dynamic excitement, atmospheric spaciousness or tonal body. The best you can say about the sound it is that it isn’t offensive – it’s not harsh or bright or annoying – but in many ways the limp delivery is offensive in itself. It might seem as though we’re being overly critical of a product that appears to represent good value for money when compared to its direct rivals, but this isn’t about the cost. Components of any price should have a basic grasp of music, a core understanding of rhythm, tone and dynamics. Plenty of sub-£100 Bluetooth speakers manage it, but not the Amazon Echo Link Amp. This is a product possessing a rare lack of talent, and the fact that it’s made by a company as huge and wealthy as Amazon is little short of baffling.